Not to be confused with Akkadian language or Louisiana French. 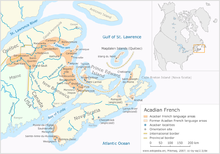 Acadian French (French: français acadien) is a variety of Canadian French originally associated with the Acadians of what is now the Maritimes in Canada. It is still spoken by the Francophone population of the Canadian province of New Brunswick, by small minorities on the Gaspé Peninsula and the Magdalen Islands of Quebec as well as in pockets of Francophones in Nova Scotia and Prince Edward Island. In the United States, it is spoken in the Saint John Valley of northern Aroostook County, Maine. Besides standard French, New England French is the predominant form of French spoken elsewhere in Maine. Many aspects of Acadian French (vocabulary, alveolar "r", etc.) are still common in rural areas in the West of France. Speakers of Metropolitan French and even of other Canadian varieties of French sometimes have minor difficulties understanding Acadian French. Within North America, its closest relative is the Cajun French spoken in Southern Louisiana as the two were born out of the same population that were affected during the Expulsion of the Acadians. See also Chiac, a variety with strong English influence, and St. Marys Bay French, a distinct variety of Acadian French spoken around Clare, Tusket, Nova Scotia and also Moncton, New Brunswick. /k/ and /tj/ is commonly replaced by [tʃ] before a front vowel. For example, quel, queue, cuillère and quelqu'un are usually pronounced tchel, tcheue, tchuillère and tchelqu'un. Tiens is pronounced tchin [tʃɛ̃]. trois (three) can sometimes sound like [tʁ̥wɔ] (originally [tʁ̥wɑ]). In the Nova Scotian communities of Wedgeport and Pubnico the numbers soixante-dix (seventy), quatre-vingts (eighty) and quatre-vingt-dix (ninety) are instead called septante, huitante and nonante respectively, a phenomenon also observed in Swiss French and Belgian French. The /ɛr/ sequence followed by another consonant sometimes becomes [ar] or [ɑr]. For example, perdre becomes pardre. This rule is also abundantly consistent in the Quebec French; however, the a is a back vowel (â). "Salut" (hello/salutations) if often shortened to s'lut. The following words and expressions are most commonly restricted to Acadian French, though most are also used in Quebec French (also known as Québécois) or Joual. batterie: the central passage through a barn (granges acadiennes) flanked by two storage bays adjacent to the eaves. Bonhomme Sept-heures: a fearful character of fairy tales who would visit unpleasant deeds upon young children if they did not go to bed at the designated hour. bord: (literally the side of a ship) l'autre bord meaning the other side (of a street, river, etc. ); changer de bord meaning changing sides (in a team competition); virer de bord meaning turning back or retracing one's steps. coude: ship's knees that are a distinctive and unusual structural feature of early Acadian houses. le grand mènage: spring cleaning, often more comprehensive than in other cultures. greer: (literally, rigging of a ship's masts) to describe a woman's attire or decoration of a youngster's bicycle. pâté chinois: a "shepherd's pie" casserole of mashed potatoes, ground meat, and corn. pot-en-pot: a meat pie of venison, rabbits, and game birds. quai: a portable wheeled boating pier pulled out of the water to avoid ice damage. tourtiéres: meat pies, sometimes with potatoes. ^ Hammarström, Harald; Forkel, Robert; Haspelmath, Martin, eds. (2017). "Acadian". Glottolog 3.0. Jena, Germany: Max Planck Institute for the Science of Human History. ^ a b c d e f g h i j k l m n Brassieur, C. Ray. "Acadian Culture in Maine" (PDF). National Park Service. United States Department of the Interior. Retrieved 3 January 2019.